Writing highlights the observations of Indian soldiers in England, including their experiences of Tube travel, the cleanliness of butcher’s shops and of how the police command huge respect. 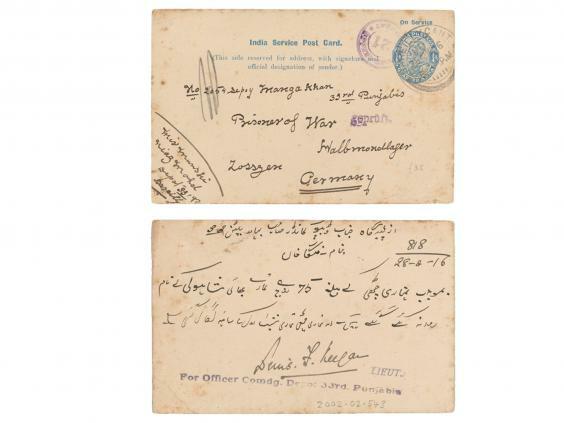 New letters from some of India’s Muslims soldiers who fought in the First World War have been discovered by an academic at Birmingham City University. The personal letters date to 1915 and reveal how Indian soldiers compared their experiences of England to their home nation. Approximately 885,000 Muslims were recruited by the Allies, the majority of whom would have never visited Europe before. One of the soldiers, named as A Ali, talks of his first experience of the London Underground and department stores. “We visited a shop where 2000 men and women were working and everything can be bought. There is no need of asking as the price is written on everything,” Mr Ali wrote. Mr Ali also reserved special praise for the police and the respect they demand. Another letter, written by Abdul Said, compared butcher’s shops in Britain to those in India. “Every shop in this country is so arranged that one is delighted to look at them. Whether you buy much or little it is properly wrapped up, and if you tell the shop man to send it to your house you have only to give him your address and he delivers it,” Mr Said wrote in 1915. Dr Islam Issa, a lecturer in English Literature, discovered the letters and said they show the personal narrative of the war. “When I decided to look at soldiers’ letters, I expected a very bleak outlook on the war. Of course, sometimes, that’s exactly what I found. But quite often, the letters were about individual experiences and very normal, human things,” said Dr Issa. “These anecdotes certainly helped shape my narrative for the Stories of Sacrifice exhibition. While there’s an important narrative about the war as a whole, the personal and human narrative was probably more striking. “Whatever your ideology or stance, you end up realising that these Muslim soldiers were individual humans and as a result, they were making sacrifices at that individual, human level,» he added. Dr Issa has been researching individual stories from the War for an exhibition commissioned by and held at the British Muslim Heritage Centre in Manchester, called Stories of Sacrifice.